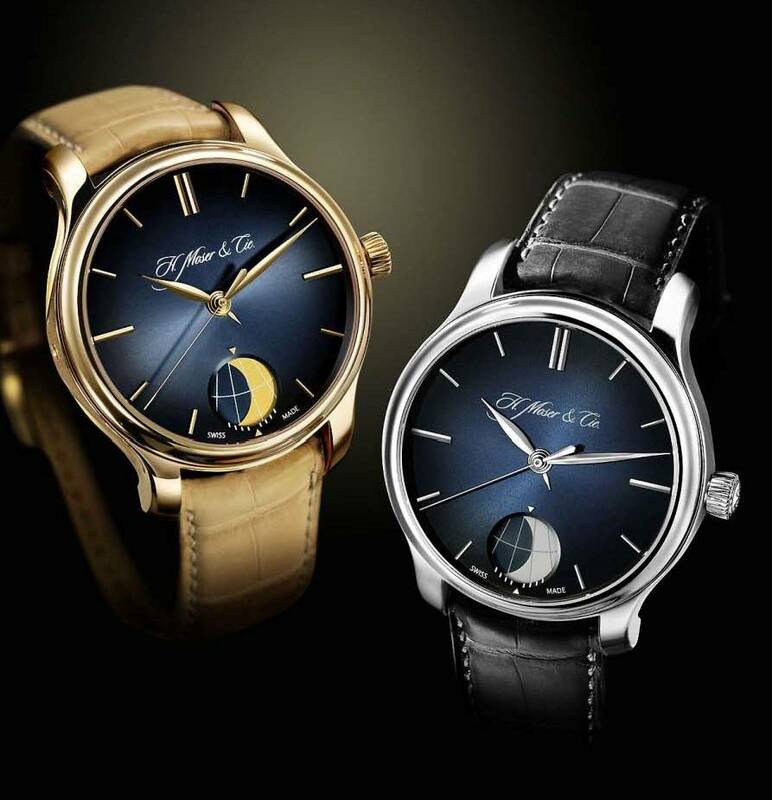 Swiss luxury watch brand H. Moser & Cie. presents a special watch with almost perpetual accuracy of the moon phase display. After more than 1,000 years of uninterrupted service, the error of this display is only 1 day. This is an exceptional watch with a moon phase display which deviates only by a single day after more than 1,000 years. It displays the moon viewed from the northern hemisphere in a large window on the dial. The sun illuminates the moon on its orbit around the earth. Depending on the relative positions of the moon and the sun, we see different amounts of the illuminated half of the moon. These positions are called phases of the moon. The phases indicated on this watch are marked in a unique way and can be set to the minute, read and predicted. One orbit of the moon around the earth, after which the moon resumes the same position in relation to the sun, lasts for 29.53059 days on average. To be more exact: 29 days, 12 hours, 44 minutes and 2.9 seconds. The complicated gear train of the PERPETUAL MOON translates this interval so precisely that the resulting deviation is only 0.23 seconds per day. Or a whole day after 1,027.30 years. In the MOSER PERPETUAL MOON, the phases of the moon are displayed inside the window on the dial at 6 o’clock. This consists of the moon phase disc with the eight internationally established astronomical quarters of the moon marked as vertical lines, as well as a division into days applied to the dial. The moon phase disc shows the currently illuminated section of the moon as the light area of the disc in the window aperture. The dark surface, on the other hand, represents the shadow of the earth. Together they form the astronomical phase of the moon. A defined phase is indicated in such a way that the associated line on the moon disc lies precisely between the two triangles of the dial aperture. In order to achieve the extraordinarily high display accuracy, the moon disc must be securely attached to the hour indicator and run with it continuously. Nevertheless, the moon phase must also be capable of correction via a pin push-button at 9 o’clock without interfering with the time display. This causes one of the 8 moon phases ton be advanced on each occasion. A wrap spring clutch – used here for the first time in a moon phase display – does precisely that. Additional orientation between day and night is provided by a reduced display with a small central hand rotating once every 24 hours. The watch, with a diameter of 40.8 mm, has the typically elegant appearance of a Moser watch with a dark blue fumé dial, and appliquéd details in the same colour as the case and the same treatment for the hands. A sweep seconds hand and the generously dimensioned power reserve display, subdivided into days, on the movement side complete this watch. A dual spring barrel guarantees a running time of at least seven days when fully wound. Of course, this watch also features the typical interchangeability of the Moser escapement with its gold pallet fork and gold escape wheel. The Moser Cal. HMC348.901 movement is a hand-wound movement with an extra-long power reserve, with true bevel wheels for gentle, low-wear winding and Moser teeth in the entire wheel train. Screwed gold mounts and Moser ground stripes also visually accentuate the intrinsic value of this movement that is visible through the sapphire glass back.